Flemington straight course specialist Redkirk Warrior will wear the blinkers for the first time when he goes into battle against Redzel in the Group 1 $750,000 Black Caviar Lightning (1000m) on Saturday. Redkirk Warrior, above. will wear the blinkers for the first time in the 2018 Black Caviar Lightning at Flemington. Photo by Ultimate Racing Photos. Redkirk Warrior is a two time winner down the famous Flemington straight with first up wins in the Group 1 $1.25m Lexus Newmarket Handicap (1200m) during the 2017 Melbourne Autumn Carnival and in the Group 2 $200,000 Bobbie Lewis Quality (1200m) at the beginning of the 2017 Spring Carnival. 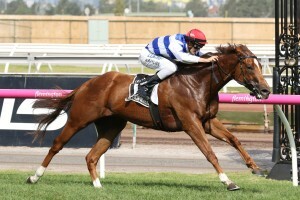 Co-trainer Tom Dabernig, who shares the Lindsay Park Team duties with David and Ben Hayes, said that Redkirk Warrior pleased the stable when he wore the blinkers in a recent Flemington jump out and expects the seven year old to race well first up again. “He has a great first-up record and we’ve put him in blinkers which he wore in a recent jump-out at Flemington and was really good,” Dabernig told AAP. “I think he’s in similar form to when he won the Newmarket. “He’s a funny horse. If he’s in his best form clearly he’s got the ability to win it, but you’ve got to respect Redzel and what he has done. “His form is amazing so you’d have to be going in there thinking he’ll be hard to beat. But outside of that I think he’s going as well as ever. Redkirk Warrior has been well beaten by Redzel at his last two runs during the 2017 Spring Carnival when tenth in the $10m The Everest (1200m) at Randwick and eleventh in the Group 1 $1m Darley Classic (1200m) at Flemington on the last day of the Melbourne Cup Carnival. Regan Bayliss has had a recall to ride Redkirk Warrior who has drawn barrier seven in the ten horse Black Caviar Lightning field while Kerrin McEvoy will stick with Redzel who will jump from gate nine. The Team Snowden trained Redzel is also a Flemington specialist with two wins from his only two starts down the straight and as well as winning the Darley Classic, was a winner over the same distance as the Black Caviar Lightning when he took out the Listed $150,000 Mumm Stakes (1000m) during the 2016 Melbourne Cup week. Redzel is the winner of his last two six starts and is the short priced $1.80 favourite at Ladbrokes.com.au for the Black Caviar Lightning while Redkirk Warrior is marked at $11.